Elements Applied: Each plant’s part is applied in herbal medicine. Active Components: The main component responsible for Gotu Kola actions is triterpenoid. Triterpenoids (dubbed as saponins), including madasiatic acid, madecassoside, and asiaticoside are medicinally active components found in the herb. Saponins produce a positive effect on collagen (the element which takes part in connective tissue formation), decreasing its content when it comes to excessive scar tissue production. The herb also includes a strong essential oil which consists of several oils, cineole, camphor, and an unknown terpene acetate. Gotu Kola is known to include fatty acid glycerids, numerous plant sterols like sitosterol, stigmasterol, and campesterol, as well as different polyacetylene components. Additional Info: Gotu Kola belongs to perennials and is indigenous to several tropical countries, like India. It can alter in its appearance reaching different stages of its growth. Shoal water is the place where the plant grows, with its leaves being on the surface, and its root being under water. Where the soil is dry it produces multiple small roots, which in their turn produce red-colored long stems. The leaves are commonly 6 inches long being 1 inch wide. The plant commonly blossoms with 3-6 flowers of red color. The fruit ripens during the entire season, and as it matures, its appearance is characterized by stout pericarp. History: Gotu Kola has gained great popularity since it was first employed in Indian Ayurvedic medicine dozens of centuries ago. The herb is described in Indian medicinal scriptures of ancient times. The plant is applied thought the Indonesia islands, including Java. Chinese medicine refers to gotu kola as one of the miraculous remedies which increase vitality. Used For: The remedy is known to rejuvenate the body, soothe the nervous system, reduce fevers, boost metabolic rates, and induce urination. The list of conditions it is applied for includes: tetanus, skin sores, senility, scleroderma, scars, rheumatism, psoriasis, nervous conditions, minor burns, psychological disorders, insanity, immunity disorders, hypochondria, hair loss, fever, epilepsy, elephantiasis, eczema, convulsions, recurrent venous insufficiency, wounds, venereal diseases, varicose veins, and intestinal disorders. It is also investigated as a remedy for AIDS. Gotu Kola rejuvenates the central nervous system, and is suggested as a remedy for nervous conditions, like senility, premature aging process, and epilepsy. It is believed to improve memory and mental abilities. It is an excellent adrenal gland stimulant, which is also applied for purifying blood and thus relieving skin conditions. Gotu Kola works as a meditation supplement, and balances brain hemispheres. The herb is especially beneficial for individuals exposed to constant stress. 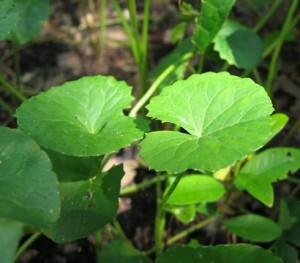 Gotu Kola is believed to nourish the brain. It is employed to relieve depression and stress, enhance body reflexes, recover the nervous system after a breakdown, increase mental powers, and treat sterility. Gotu Kola is a stimulant for the nervous system, a nourishing remedy for the organism, a medicine for hypertension, and a cleansing herb for toxic substances. It is successfully applied for elevated blood pressure, hepatitis, venereal diseases, urinary infections, congestive heart failure, blood conditions, and rheumatism. It can mildly induce urination, eliminating membrane swellings and flushing away excess water. It promotes sore healing. Gotu Kola improves blood circulation. Producing a positive effect on circulatory system, it also makes capillaries and veins stronger. It has been applied for tingling in legs and hands, leg pains, and phlebitis. Gotu Kola provides normal scarring process if used when sore inflammation has not yet been relieved. Occasionally it was proven to be successful in treating burns of third degree when applied at once after the incident. Regular topical distribution over the inflamed area, aided by intramuscular injections, decreased skin shrinking during recovery. Gotu kola also impeded infection and provided decreased scar tissue production. The herb is the best remedy for rejuvenation, especially when it comes to nervous affectations. Preparation and Intake: As a topical remedy Gotu Kola oil is distributed over the body, even the scalp area, to cure nervous conditions. To make tea, use 1-2 teaspoons of dried herb extract for a cup of boiling water and let it infuse for 10-15 minutes. The common dose is three cups a day. Tincture is applied in a quantity of 10-20 ml thrice a day. Pharmaceutical preparations which include nearly 100% triterpenoid overall, are commonly used in a dose of 60 mg one or two times a day. Safety: Gotu Kola is commonly considered safe for oral application. External usage of gotu kola led to dermatitis, though only anecdotal cases are reported. Pregnant or nursing mothers are not recommended to use gotu kola.